Welcome to Canfield Vet! Our veterinary hospital is a converted horse barn which, in the past, housed the Brown family horses. We hope you will find our animal hospital to be appealing and comfortable for both yourself and your pet(s). Our goal is to provide personal, professional, appropriate and concerned veterinary care for our clients' dogs and cats. Concentration on health promotion and disease prevention is emphasized during preventative examinations. The practice is a 3 veterinarian fully equipped primary care facility providing the services necessary for the diagnosis and treatment of sick or injured dogs and cats. Among the services provided are routine preventative care, vaccinations, surgery, digital radiology, dental cleanings, oral surgery, digital dental radiology, cold laser therapy, laboratory, and in house pharmacy. The Staff welcomes your inquiries and comments and invites you to tour our facility. Appointments for office visits and hospital procedures are scheduled Monday through Saturday. Injured or sick animals are received during regular hospital hours. After hour emergencies are referred to an emergency facility. After hour medicine pick-up is available. If you live in Pittsford or the surrounding area and need a trusted veterinarian to care for your pets – look no further. Your pets’ health and well-being are very important to us, and we take every possible measure to give your animals the care they deserve. We are happy to offer a number of resources that enable you to learn about how to take better care of your pets. Please feel free to browse our site, particularly the informational articles. The best veterinary care for animals is ongoing nutrition and problem prevention, so becoming knowledgeable about preventative pet care is essential to the ongoing success of your animal’s health. If you have any questions, call (585) 383-1110 or email us and we'll promptly get back to you. Our Pittsford practice location is very easy to get to -- just check out the map below! At Canfield Vet, Dog & Cat Hospital, we treat your pets like the valued family members they are. Dr. Margaret Ciaccio Brooker graduated from the University of Vermont before completing her veterinary degree at Tufts Veterinary School in 1992. Barry Brown grew up in Trenton, New Jersey. He graduated first in his class from Trenton Central High, received a B.S. with honors from Rutgers University and his veterinary degree (VMD) with high honors from the University of Pennsylvania. Dr. Ann Hill joined Canfield Vet in June 2014. She comes to Canfield from Amherst Small Animal Hospital in Snyder, NY. 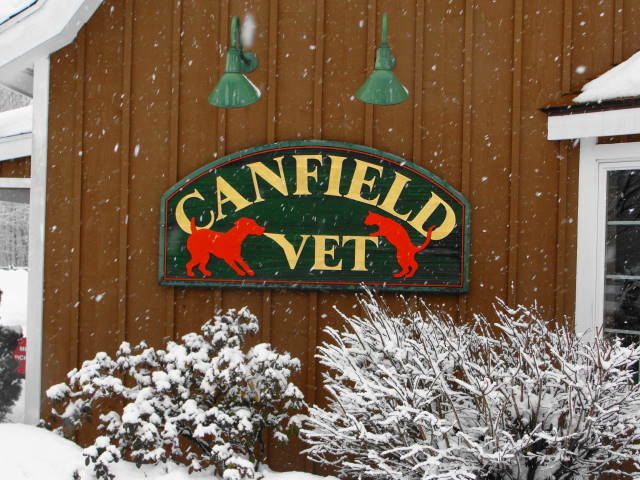 Dr. Zink joined Canfield Vet in July 2016. She came to Canfield following 10 years of practice at Chili Animal Hospital. Prior to joining Canfield Vet, Joy worked in both large corporations and small businesses in various financial and managerial roles. Sue Hall has been a technician for almost 30 years and has been with Canfield Vet since September 2001. Ellen Bartholomew joined the Canfield Vet family in 2001. Dawn St. James join the Canfield Vet family in 2007 to follow her love of animals. "The amazing staff members and doctors at Canfield are so caring, smart and dedicated to what they do! When your fur kid is trusting you to take care of them for healthy or sick visits, I would entrust Canfield. For anyone in the area looking for a small family vet who will remember you each visit and see the same familiar faces everytime you go in, this is the place for you. They clearly have a family bond that is so great to have in an animal hospital. Thank you for taking care of my pup when we needed help the most." "I cannot express how grateful I am for this practice and the kindness of Dr Hill and all of the staff at Canfield. I have three animals I take here (2 cats and a dog) and the way they handle the special needs of my diabetic cat is amazing. His variety of issues and emergencies have been stressful and I always leave the office feeling confident and informed on what's happening. Highly, highly recommend." "My pets (2 dogs and a cat) have been going to Canfield their entire lives, and I wouldn't even consider going somewhere else. Dr. Brooker knows all of them by name and treats them as if they were her own. Our animals are not just family members, they're the most important things in our lives, and I wouldn't consider giving them anything but the best in care, and that's what I believe they get at Canfield." "I just took our 2 current "children" to Canfield Vet, Dog and Cat Hospital for the first time 2 weeks ago. Our cat had never been to a vet, except for neutering, as he was found and taken in by our son in college! The experience was outstanding! The staff was so friendly and welcoming, and the atmosphere was calm. Both the dog and cat were so relaxed and the visit went much more smoothly than I anticipated! Thank you all so much for helping to make this a good morning out--for all of us!!" "All of our animals are happy patients of Dr. Brooker and staff! They treats like family and are extremely knowledgeable and compassionate about the care of animals and their humans." "I've been going to Canfield Vet for over 15 years with various pets. We've always received courteous & professional advice. I always felt that the vets at Canfield truly care about our animals & they understand what we as owners are going through. I wouldn't consider going anywhere else." "I think the fact that my dogs are excited to go to the Vet and don't want to leave shows that everyone they encounter here is warm, affectionate, and caring! The treats don't hurt either!😉"
"So thankful for Canfield Vet! They are always so responsive and helpful! Can't say enough how much I appreciate their great care and compassion!" "We have been going to Canfield Vet for over 15 years with our family dogs and are very pleased with the care and compassion our fur-babies, and we, have been shown throughout the various stages of a pet's life and the unique challenges of each. The doctors and office staff have gone the extra mile many a time to make sure our pets' needs are met and that they have a great quality of life. Thank you Canfield!" "The staff was so great with my little Lily Munster, and she can be quite a princess at times. Thank you." "I have been taking my crew here for a few years now. It is a warm inviting atmosphere and everyone is so friendly. It's a beautiful drive through me don ponds park to get there. We usually plan a nice walk before our appointments. I treat my dogs like family members and the staff here does too, and that's why we won't go anywhere else!! Thanks Canfield."